The absolute best glove I have ever used! When you swing your driver as hard and fast as I can you need to have a glove you can Trust and count on. That's why I use the Hirzel Trust Control Gloves. slip during my swing, even when it's raining or wet. thousands of balls a week. I need to have a glove that will last. Hirzel Gloves gives me the confidence I expect and Trust I depend on. As a medium to high handicap player, you want to be able to effortlessly maintain a firm grip in order to achieve longer shots and improve your control over the ball’s direction, leading to fewer poor shots. Our TRUST Control gloves with thicker, more structured palm leather are perfect for you. HIRZL Trust Control golf gloves are made with a unique Kangaroo leather palm and Cabretta leather/airtech mesh back. 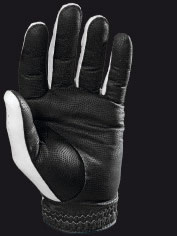 The Trust Control glove increases grip by 5x in wet conditions and 3x in dry weather.